When Robby and I started the job of improving and painting the entire exterior of the house, we were partially motivated by the feelings we had while sitting on the front porch. 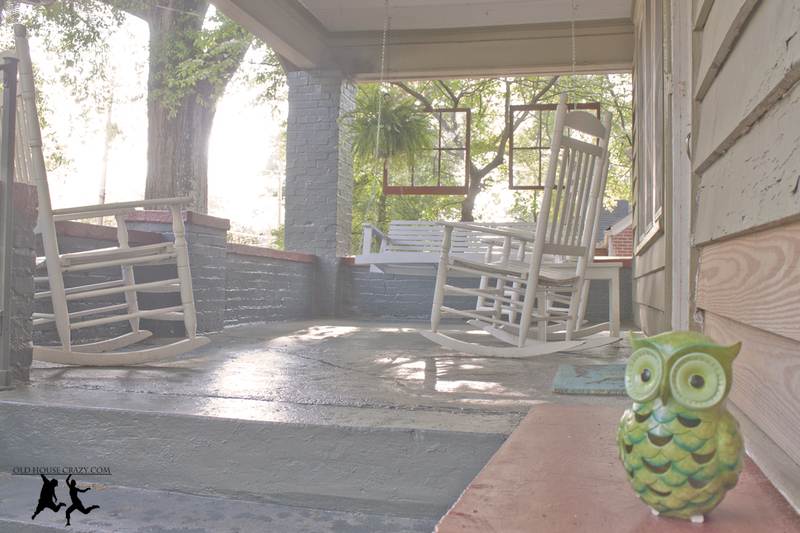 They were love-hate feelings: we loved the space and function of the porch, but hated the thick, peeling layers of ugly paint that stared at us while we kicked back. During the warmer months (about 9 months out of the year in Atlanta), we frequently spend more waking hours outside on the porch than inside, so the porch was high on the list of spaces we wanted to address. Since starting this process, we’ve received many compliments from folks in the neighborhood about the increased curb appeal & value & blah blah blah, but truthfully we did this work much more for our own enjoyment than for anything else. The prior owners of our house painted it the infamous pea soup green from top to bottom. While we were able to get past this during the buying process, for the past 3 years it has been something that makes us shudder every time we get up close to the exterior, like when we’re hanging out on the porch, and especially when we have company during daylight hours. With spring time being prime porch weather, we psyched ourselves up and tackled a major portion of the porch work a couple weeks ago, and have since really enjoyed the new scenery. Bungalows like ours built in the 1920s were historically painted with a three or four-color paint scheme. Whatever the main wall color, one or two shades darker is the foundation color, and then a complementary trim color and [optional] accent color are chosen to bring everything together. It might sound crazy, but it’s what people did back then and we think it’s pretty charming. Having multiple colors does make the painting process slower (more brushes to wash out, more cans of paint to shake up, more concentration & effort when painting), but also more satisfying once it’s all completed. We are painting in a four color scheme, with two of those colors (foundation and accent) showcased on the made-over porch. 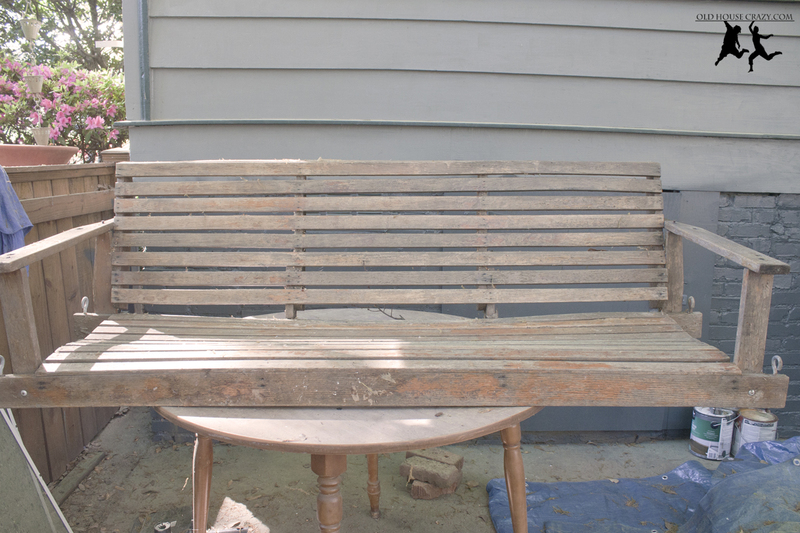 In addition to the floor and masonry paint job, Robby took our sad, chipped-up porch swing and sanded and painted it to match the rest of our white porch furniture. Instead of mis-matched furniture that, although not immediately noticeable and bothersome, was distracting, we now have a nice, subtle flow of clean, white furniture on the porch. 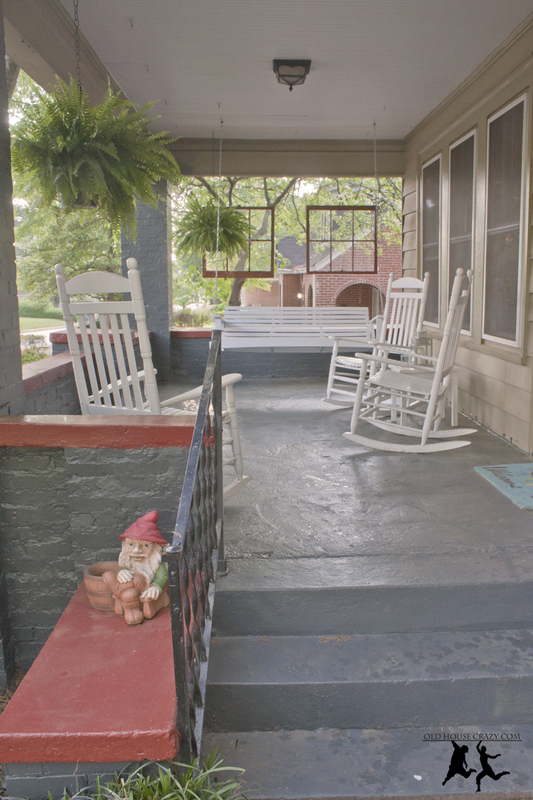 While Robby had the swing down for painting, he also took the time to move the hooks a little farther toward the edge of the porch to give everything else a roomier, less-crowded feel. He also re-painted the hanging window sashes to match the red accent color of the porch rail, which ties them back to the house nicely, whereas before they were neat, but semi-random porch decor. Finally, I picked out two lush Boston ferns at my local Lowes to hang from the inner corners of the porch ceiling. These were the finishing touch on our make over. Large hanging ferns remind me of the laid-back, beautiful old porches in Charleston that I love so much, and they require little maintenance. I’ve found that early in the season the plant selection is the best, as the store employees haven’t had the chance to under-water or scorch them yet. We have a few extra sets of unused hooks in the ceiling, so there is still opportunity to hang some other baskets with shade-loving plants or flowers. As the season goes on, I’d like to learn how to make some coordinating cushions for the seats of the rocking chairs and the swing like these or these that I found on Pinterest, so stay tuned! Still to be completed on the porch are the wall and the windows behind the rocking chairs, which will be scraped down, painted in our chosen scheme, and restored. This entry was posted in DIY, Front Porch, Furniture, Painting, Uncategorized and tagged DIY, diy project, don't hire a professional, painting. Bookmark the permalink. well done. it looks wonderful! Hi Christy – Everything looks terrific. I just hung an old window on my porch but I’m finding it’s swaying back and forth with the wind and hitting the column on the porch. Are you having the same issue? If yes, how did you resolve? Thank you!